Lonnie Wheatley, TULSA, Okla. (February 25, 2015) – Mark Smith and Chase Stockon. An unlikely duo to headline the weekend. 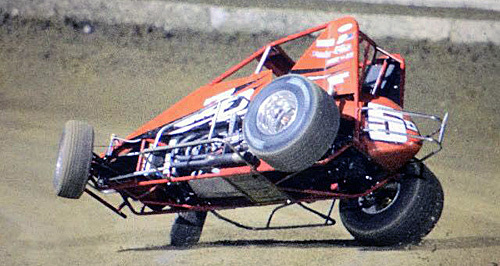 That was the case though, as Mark Smith bested 67 for “King of 360’s” honors at Tampa’s East Bay Raceway Park while Chase Stockon’s consistency put him atop USAC Sprint Car point charts through the initial half of Winter Dirt Games. Mark Smith. That’s about as anonymous sounding as it gets, among the leading candidates for clandestine, shady motel sign-ins. But, Smith of Mach 1 Chassis proprietorship is legit, even if folks outside of Posse land aren’t aware. Make that “weren’t aware,” as they should be aware now. Smith ultimately succumbed to Aaron Reutzel’s tenacity in the Thursday opener, chased Jason Sides to the line on Friday rubber and then worked his way through traffic to perfection on Saturday night to lay claim to the crown and $10,000 in the Ronald Laney Memorial. It’s an event that has a penchant for offering up the unexpected. Other unexpected “King of 360’s” Nationals winners in recent years include Danny Holtgraver two years ago and Canadian Glenn Styres in 2012. Holtgraver made the cut for Friday’s feature but took the role of spectator for “A” Main action on the other two nights while Styres watched all three features from outside the cockpit. That’s something that can happen with 67 cars and a challenging format. Only 33 of 67 made it to a feature on one at least one of three nights. And the list of those that made all three features is an impressive one that along with ultimate winner Smith included the rapidly-rising Reutzel, third-place finisher Johnny Herrera, previous winner Wayne Johnson, past winner Terry McCarl, accomplished veteran and ritzy bleeder pusher Jeff Swindell, almost 2014 ASCS champ Brad Loyet, past All Star champ Chad Kemenah, ageless Hall of Famer Danny Smith, Posse kingpin Greg Hodnett and Florida aces that proved themselves to be for real, A.J. Maddox and Matt Kurtz. Reutzel and Herrera are the only ones among that list of 12 that are likely contenders for the Lucas Oil ASCS National title, though Jeff Swindell is expected to take in a significant portion of the tour. At least until it comes time to make the trek to the northwest. And, with full points in effect each night, Reutzel is the virtual series leader by 50 points over Herrera with only Tony Bruce, Jr., and Seth Bergman still within 100. Woe to those that struggled in Tampa, the early hole isn’t insurmountable but it’s formidable. Meanwhile, a bit to the north on I-75, the non-wingers opened up 2015 with three nights at Ocala’s Bubba Raceway Park, albeit a day late after inclement weather pushed the three-day set back to Friday, Saturday and Sunday. While East Bay offered up an unlikely winner in Smith, there were no such surprises at Ocala. Robert Ballou, who held perhaps the hottest hand in the game over the final half of 2014, opened the set with a Friday night win. 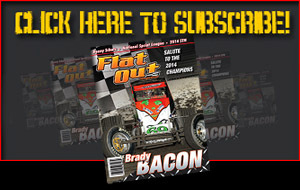 After that it was Brady Bacon and Dave Darland, who both consistently win in something, somewhere, as much as anyone, reached victory lane on Saturday and Sunday, respectively. Each of the typical front-runners experienced at least one night of issues though. Darland used a provisional after Friday heat race issues to finish 16th, Bacon suffered a Sunday night DNF that broke a string of no DNF’s at all throughout a 2014 championship season, Ballou was outside Sunday’s top ten and Bryan Clauson struggled through an ugly weekend highlighted by a best run of ninth on Friday. The benefactor was Chase Stockon, poised to challenge for his first USAC crown after posting back-to-back runner-up finishes on Friday and Saturday before a fifth-place run on Sunday. The only driver to finish among the top five during all three Ocala nights, Stockon was also just one of two drivers to finish among the top ten all three nights along with C.J. Leary who was tenth, tenth and seventh. After podium finishes of third on Saturday and then second on Sunday, “Big Daddy” Chris Windom left Ocala 25 points off Stockon’s lead pace and two points ahead of Bacon. Reigning POWRi Midget champ Zach Daum tried on the bigger car and survived the wild bicycle that made the headline photo (by TeeJay Crawford) to run seventh in Saturday night’s feature before engine issues sidelined the Pocahontas racer on Sunday. The series swap sites this weekend, with USAC tackling East Bay for three nights while the winged ASCS 360’s take to Bubba Raceway Park for two night. Meanwhile, in a land Down Under it was “Mad Man” Kerry Madsen taking yet another win as Brooke Tatnell put the clamps on a ninth World Series Sprintcar championship, ripping it from the grasp of David Murcott. And in the 305 world, Chad Wilson scored his second win in as many weeks after Logan Scherb rolled across Lone Star Speedway’s scales in Kilgore, TX, too light on Saturday night.